I advise that, contrary to the dates published in this year’s tennis calendar, the Roo Trophy will take place from Monday 18 January to Saturday 23 January. It is envisaged that the format will be as in 2008 – knock-out singles with repechage, & round-robin doubles – and that entry forms will be available in September/October, to close at the end of the year. On the weekend of the Winter Solstice a ridiculous amount of court time was devoted to moribund bodies whose associated brains showed no shame or sense of the ridiculous in entering competitions under the description “Masters” (sic). The realism of this view was made apparent by the knee-bandaged but otherwise serviceable body of Venerable Genuine Master Julian Snow being involved in two almost total whitewashes of opponents Hamer & Parker and Hince & Bull in order to reach the final of the Over 40s which will be played on 11th July. Ted Cockram’s cameo part in this left him with energy to carry the septuagenarian Guest to a 6/4 victory over the septuagenarians Garnett & Wheeler in the over 60s in the first set before realism or weariness or brain switch off allowed the older pair to storm through 6/1 6/2. The latter pair, having had to play out a second set 6/4 against Hewson & Guest in the over 70s final (sic) were understandably showing signs of weariness as they succumbed to Richardson & Hurburgh in the over 60s final only an hour later on Sunday morning 4 and 2. The over 50s, a sort of nondescript age where it would have been good to see some female entrants to distract attention from the first signs of major decay setting in, was won by Hurburgh and Hamer against Hince and Bull 4 and 4 after an interesting preliminary on the Saturday when Barker & Parker were only beaten 0/6, 6/2. 6/3. Some amazing shots were pulled off in all age groups, sufficient to fill memory and more than fill sports commentary for the few decades left to the shot makers, and not all the better than half a yard chases were made with back spin off penthouses any more that those at the hazard end depended on wish-fulfilling eyesight. Information about this tournament would not be complete without noting that the principal rapporteur was the tournament organiser who reports that the tournament organisation was a brilliant success, even including the catering which the non-cooking organiser managed economically so that even the Coles house-brand chocolate chip biscuits were finished once the President’s attention had been drawn to them. This account escaped interpolations from the V-P and is therefore entirely balanced and accurate. The Australian Amateur Doubles champions, Mike Happell & Bret Richardson, yesterday won the RMTC club doubles championship for the first time, defeating the scratch partnership of Julian Snow & Tim Heughan 6/1, 5/6, 2/6, 6/3, 6/4. Snow was unable to defend with his usual partner, Chris Sievers, who injured his hand in practice a few weeks ago. Heughan, nominally much the weakest player on court by handicap, deserves great credit for the way in which he responded to the call to replace Sievers; he played really well and was by no means outclassed. When he & Snow led by 3 games to love and 40-0 in the final set, a boil-over seemed a distinct possibility. To their frustration, however, Happell & Richardson raised their game at the crucial moments, illustrated by the final shot of the match when Happell readily beat chase worse than two with a speciality cross-court cut volley return of serve. It was a much more competitive match than many had anticipated, which entertained a decent Monday evening crowd at the RMTC. Come in and watch the club doubles final this Monday at 6pm and at the same time take the opportunity to introduce a friend or two to the club. The match should be brilliant as assuming everything goes according to the seedings it will be a Snow/Heughan v. Happell/Richardson final. 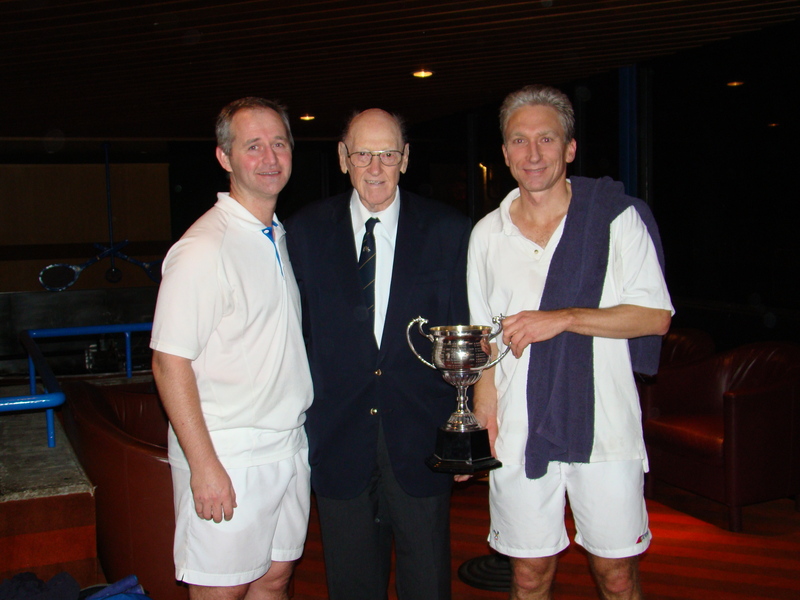 The Queen’s Birthday Handicap Doubles 2009. 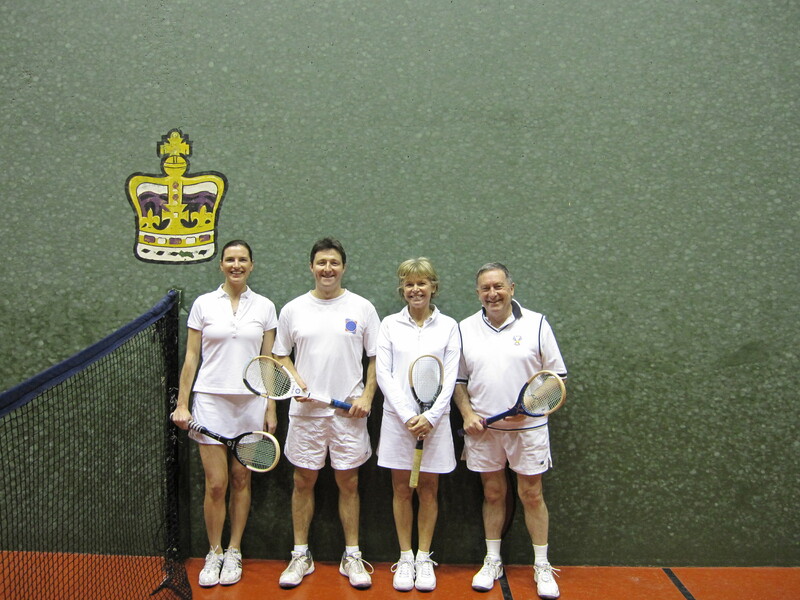 Ten pairs assembled at the club on a cold wet day to celebrate Her Majesty’s birthday, and to play four sets of tennis. With only a single exception (names withheld to protect the innocent), all pairs won at least one match, but only two pairs won all four: the pro-am combination of Ruaraidh Gunn & Prue McCahey, and the scratch partnership of Peter Fenwick & Claire Heughan. The final, between these two pairs, began with Claire (handicap 64) serving to Ruaraidh (+10), a phenomenon not previously witnessed by this writer. Played as it was off the maximum handicap difference, once Ruaraidh & Prue had quickly gained the service end they were able to exercise complete control over proceedings. They won 6-1. Both pairs deserve credit for their very steady play, albeit from opposite ends of the handicap spectrum, through the day. Claire Heughan, Ruaraidh Gunn & Prue McCahey (paired centre), Peter Fenwick. The June newsletter is now available online. Find it in the right hand column or just click here.